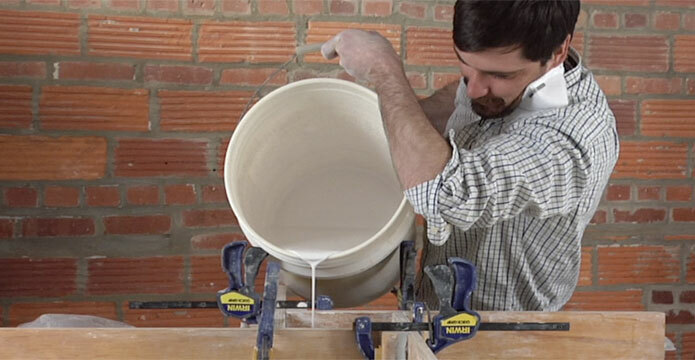 Discover new forms by making slump molds for pottery with easily accessible materials! I have a bit of an obsession with making and using slump molds for clay these days. This fascination with the drape mold was no doubt influenced by filming Brenda Quinn’s video! In today’s video clip, an excerpt from her video Mix & Match: Forming Techniques (which is ON SALE this weekend! ), Brenda shares some of the interesting ways she uses cheap, readily available materials to make slump molds for clay! – Jennifer Poellot Harnetty, editor. Being a teacher, Brenda Quinn is always looking for new ways to inspire her students to create new and exciting work. She realized that using plaster molds for handbuilding didn’t allow her to experiment with new slump mold forms because the process of making molds was too time consuming. Plus, she wanted to limit the amount of plaster in her studio. So she started playing around with different materials for slump molds that would allow her to play with different ideas without spending a lot of time or money. Using cardboard to make slump molds for pottery enabled Brenda (and her students) to quickly test new forms and experiment more. If they didn’t like a form, all they had to do was throw the mold in the recycling pile! Successful cardboard slump molds could be remade in foam core. And best of all the molds could be mixed and matched or combined to make variations. Best of all, all of her explorations into various techniques for slump molds have also helped her keep her own studio practice exciting! This weekend, save 25%! Enough of the same ol’ same ol’! Brenda Quinn’s video Mix & Match: Forming Techniques is the perfect antidote if you've become stuck in the studio. You’ll discover how she mixes and matches handbuilding and throwing techniques to make unique pottery that is both decorative and functional. Brenda’s techniques are both versatile and accessible, so no matter what your skill level, you’ll be itching to get into the studio and play! And now through August 21, 2018, you can save 25% on this action packed video! Sale valid through 8/21/18 at 11:59 pm EDT USA. Do you have a fun and creative way to make or use slump molds? Tell us about it in the comments–we’d love to hear it! I use sheets of foam packaging, scavenged from the dumpster behind a local white goods retailer. Furniture is sometimes protected by polystyrene foam sheets. I use a sharp exacto knife to cut a shape into the foam. Save the cut out piece to use to support the plate after it is turned over when leather hard. It is helpful to make marks radiating from the cut edge so that you can cut your slumped slab accurately, after it has dropped into the mould. To cut polystyrene foam take it and a vacuum cleaner into a bathroom and close the door. Place the foam with the hole in it onto a flat board. Drape a soft slab over the hole whack the board firmly onto a solid surface. Rotate the board 180° and whack it again. It is important to leave the slab without touching it until it is leather hard. To turn over, place the cut out piece of the polystyrene foam (it will have to be trimmed first to fit) onto the slumped slab, place another board on top and flip. This is great. Thank you. I love simple, low tech and low budget approaches!